Someone just asked me why I wasn't blogging anymore. I replied that I've really been too busy but then realized that I've been on a couple adventures that I should share. I pulled up my blog and realized that I haven't made an entry since January of this year. Wow! I guess I have been busy. Just a couple of weeks ago I went on a great trip to Bimini. I just saw two posting from fellow media writers, who also went on that trip, so I guess I should post too. Here's a few photos and later I will post a full account. So yes, I'm blogging again. 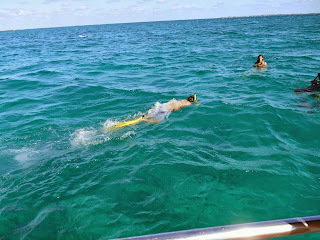 Snorkeling in Bimini, My first time and I saw two baby sharks and a barracuda. One of our first stops in Bimini ws a great Bahamian Pizza place that made Lobster and conch pizza. Delish! 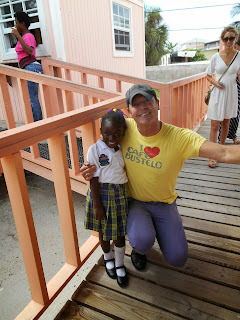 This adorable little girl was wandering about singing and entertaining the guests. We both were wearing yellow and purple so I had to have a photo taken with her. 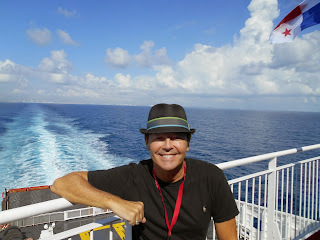 Here I am on the ship on the way to Bimini. More photos and commentary to come later. The trip to Bimini was really lots of fun and I highly recommend it. We stayed overnight at the Bimini World Resort that was very nice. I'm actually planning another trip. Cheers.